The 10th Anniversary of the Minewarfare Association was celebrated onboard HMS WARRIOR 1860 in Portsmouth on 24 March 2018. The event took the form of a formal dinner and was attended by over 100 members, wives, partners and guests. The Guests of Honour for the evening were Captain and Mrs Roger Readwin Royal Navy, who at the time was Captain Mine Warfare, Fishery Protection and Patrol Vessels (CMFP). The evening started off with pre-dinner drinks on the Gundeck where old acquaintances were renewed and new acquaintances formed. Guests had travelled from all parts of the UK and were primed ready for a good evening with a few surprises arranged by the organisers. The call for dinner was sounded and after everyone had taken their seat (like herding cats) the new MWA Standard was proudly paraded by Ex CPO(MW) Sam Cook. The MWA Standard was the idea of the members who raised the idea at 2017 AGM. The standard was kindly funded by the Queensferry Masonic Lodge and its production was overseen by Sam who gave direction and guidance on the requirements to the manufacturers. Whilst the Standard was blessed at the 2018 AGM held in the forenoon, the 10th Anniversary Reunion Dinner was the first formal parade of the standard and for some of the guests, it was the first time they had seen it. A very proud moment and a key achievement for the MWA. The MWA Bish, Mrs Debbie Harvey, provided a suitable prayer for grace after which dinner was served. The beer and wine flowed freely and so did the dits and conversation throughout the three courses of dinner. Entertainment in the form of sea shanties was provided by Shep Woolley and the Cabin Buoys, known to many of the elder brethren of branch some of which served with Shep. After dinner a loyal toast was given by Lieutenant George Turnbull Royal Navy followed by the after-dinner speeches. First up was the MWA Chairman Ex WO(MW) Dixie Dean MBE, who formally thanked Captain and Mrs Readwin for attending then outlined the key achievements of the MWA over the 10 years of its being. He also thanked all of the members for their support and in particular thanked the committee and other key members for all their efforts in making the MWA what it is today. Captain Readwin responded with a speech based on the efforts of the Mine Warfare Flotilla and current operations that were either ongoing or had been achieved by the Naval Service. He spoke very highly of the professionalism of the MCMV Crews and how he had witnessed this first hand during visits to the Middle East. He also informed members of some of the ongoing discussion to improve conditions of service for crews and the Mine Warfare Branch as a whole. This included the reintroduction of the Mine Warfare Branch Badge which it is hoped will re-establish the unique identity of the branch; this was met with a round of applause and cheers. He thanked the MWA members for being the forefathers of the Mine Warfare Branch and setting the high standards being achieved today. On completion of the speeches Dixie presented Captain Readwin with a gift by way of a thank you from the MWA members and to mark his attendance at the 10th Anniversary Reunion Dinner as the Guest of Honour. Mrs Readwin was also presented with a bouquet by Vice Chairman Taff Reader. A presentation was made by Captain Readwin to the Queensferry Masonic Lodge by way of a thank you to the lodge members for sponsoring the MWA National Standard. The gift of a framed picture of ‘Vernon Creek’ was accepted by Lieutenant Commander Bob Hawkins Royal Navy, who is a member of the lodge. To further mark the occasion, other presentations were made namely; Wayne (Ronnie) Barker was presented with a framed picture of key buildings in HMS VERNON by Captain Readwin in recognition of his efforts as the MWA Webmaster over the 10 years. Mr Sam Cook was presented with a framed picture of the MWA Standard in recognition of his efforts in the manufacture of the MWA Standard. A surprise presentation was made to Taff Reader for all of his efforts and hard work in the formation of the MWA. Once the formalities were over we were entertained by Shep with more sea shanties and music to dance to which went on until 2330, the time by which we had to be clear of the ship and the dockyard, sorry, I meant Naval Base. Guests departed fully fed, watered and entertained but some still found the energy to carry on in local hostelries until the early hours. The event most certainly marked the 10th Anniversary of the MWA in a way to be remembered. Nautical venue, nautical theme with a fantastic menu, great entertainment but most of all in the great company of like minded people who between them represented some 3000 years of service to the Royal Navy but more importantly, to the Mine Warfare Branch. 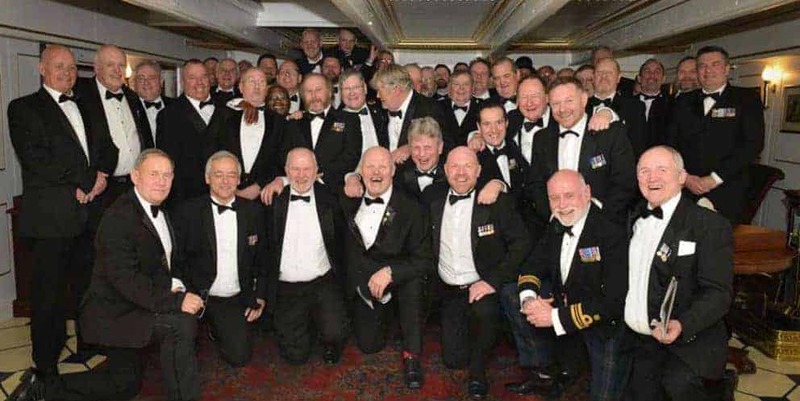 The next key milestone reunion will be the 15th Anniversary in 2023 but in the meantime, we continue to practice on an annual basis with the annual reunions in Portsmouth. Great memories, great night and great company.